The Singles’ Day sale, also known as the 11.11 Sale, obtained worldwide attention as Alibaba Group announced its achievement of US$30 billion in gross merchandise value (GMV). The e-commerce giant achieved a higher GMV as compared to its previous year at US$25 billion, although it garnered a lower growth rate. The online shopping festival has gained much attention in Malaysia this year as we saw various e-commerce players promoting attractive and extravagant promotions. As such, iPrice conducted an analysis to find out how the 11.11 Sale influenced consumer behavior and share insights on how businesses can better prepare themselves for future sale events. 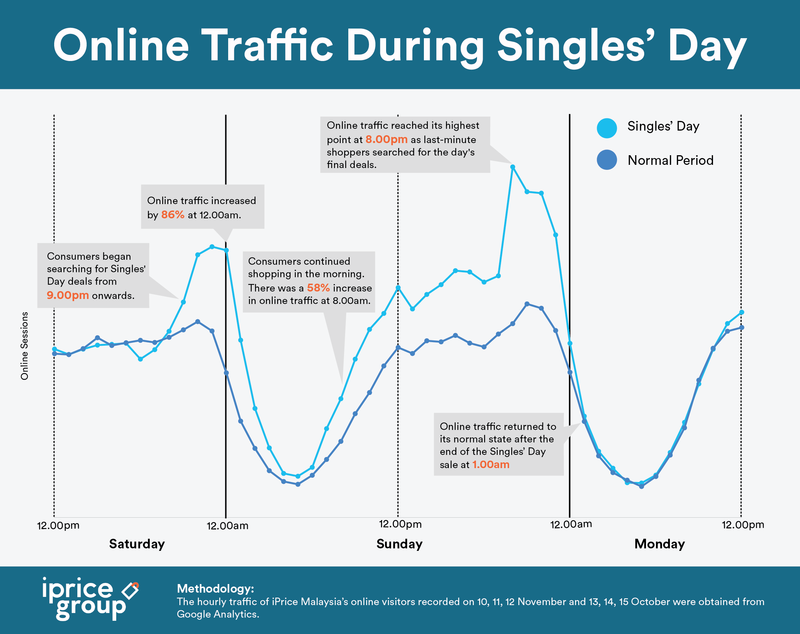 During Singles’ Day, there was a 47% increase in online traffic on 11 November when compared with a similar period in the previous month. Interestingly, consumers began searching for deals as early as 9.00pm on 10 November, a day before Singles’ Day. This is significant as consumers in 2017 only began searching for 11.11 Sale deals after 11.00pm. The increased interest in the sale was influenced by the extravagant campaigns organized by various e-commerce players to promote Singles’ day. One such example was Lazada, who organized a star-studded live event to launch its sales campaign. This was similar for other e-commerce players such as Shopee, 11street, FashionValet and others who organized their own 11.11 Sale campaigns as well. In addition to this, various e-commerce platforms have been encouraging consumers to save their preferred products and deals in their online shopping cart prior to Singles’ Day. As such, this has influenced consumers to shop online much earlier in order to secure their orders. Similar as the previous year, online traffic grew exponentially at 12.00am on 11 November. Online traffic increased by 86% at midnight when compared to a similar period in the previous month. The big growth in online traffic was evident as major players such as Lazada, Shopee, and 11street experienced issues with its payment gateway from midnight onwards. According to the whitepaper the State of E-commerce, online traffic during the weekends are usually lower when compared to weekdays. This was not the case for Singles’ Day when online traffic grew exponentially on Sunday, 11 November. In the morning of the sale day, consumers began searching for deals as early as 8.00am in the morning. Online traffic was significantly higher throughout the day and reached its peak at 8.00pm in the evening. This a unique trend in 2018 because online traffic in the previous year was more stable at 8.00pm. This trend was probably influenced by the increased number of promotions which were offered at specific timings. For example, merchants such as Lelong and 11street organised live shows or flash deals at the certain time of the day to promote a specific product, category, or brand. One similar trend continued from the previous year was that consumers are avid last-minute shoppers. This was evident as there was a rapid rise in online traffic between 8.00pm and 12.00am, indicating that consumers are shopping for last-minute 11.11 Sale deals. 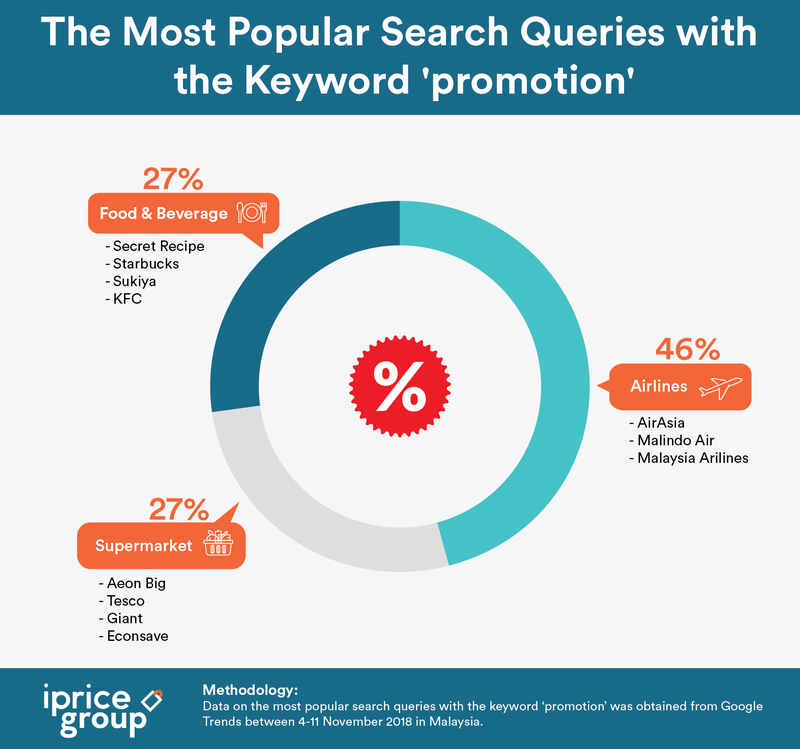 Popular keywords searched on Google prior to and during the 11.11 Sale were airline, supermarket, food and beverage promotions. 46% of the most popular keywords were airline related promotions. The most searched airline keywords during the Singles’ Day period were brand names like ‘airasia’, 'malindo air’, and ‘malaysia airlines’. Keywords related to supermarket deals were popular as well such as ‘aeon big’, ‘tesco’, ‘giant’, and ‘econsave’. As for food and beverage deals, consumers were searching for ‘secret recipe’, ‘starbucks’ and ‘sukiya’ and ‘kfc’.